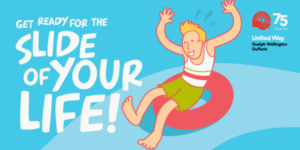 Experience a 1000-ft Water Slide down the streets of Guelph and help United Way Guelph Wellington Dufferin kick-off our 75th Anniversary Campaign! Sliders must be at least 5 years of age and 46″ tall to ride the slide. All sliders will be required to sign a waiver before riding the slide. Sliders under 18 years of age will need sign off from a legal guardian. The Slide will go down Norfolk Street, beginnning at Macdonell St. and ending at Nottingham Street. The registration tent will be located at the top of the slide, on the south-east corner of Norfolk St. & Macdonell St. Participants can enter the event zone at Cork/Norfolk or Fountain/Norfolk. The closest parking lots are located on Wilson St.(beside City Hall) and off of Macdonell St., east of Norfolk). Street parking is also permitted on various streets in the area (please obey parking signs). We recommend you walk, carpool or take transit to avoid having to find a parking spot! For maximum speed and safety, all participants are required to slide on inflatable tubes. You can bring your own tube or you can “rent” one for a $5 fully-refundable deposit (per tube) upon return of the tube. Wave #2 – 12 p.m. – 3 p.m. Wave #3 – 3 p.m. – 6 p.m.
For safety reasons, all children must ride on their own tube. But, there will be a lane just for kids and their parents. Bathing suits are not required; however please avoid jeans and clothing with rivets. The price range depends on the number of times you want to go down the slide. Tickets start at $15 for a single slide in the early bird pricing. Early bird pricing is available until August 30th. You can pick up your tickets/wristband at the registration tent when you arrive on event day (located at the top of the slide at the corner of Norfolk & Macdonell St). Wristbands will be required to ride the slide. If you pre-purchase your ticket online prior to the event, you can check-in at the registration tent in the “Advance Ticket” line. Please bring proof of your ticket purchase, either hard copy or on your smart phone, which will be used to give you your wristband. Tickets are available to purchase on event day, as long as we aren’t sold out! Yes – there will be a BBQ on site. The Guelph Water Wagon will also be onsite all day, so bring your refillable water bottle with you! There will be an upsupervised area to leave belongings while you slide. However, we suggest you limit personal items/valuables or bring a waterproof bag to keep them with you. We are not responsible for lost, stolen or water-damaged items. The tickets are non-refundable, but you can give them to a friend. Every slider will be required to sign a waiver before using the slide. What is being done about water conservation? Water conservation has been top-of-mind when putting on this event. The slide will be recirculating water throughout the day to minimize the amount of water being used. It is estimated that between 10,000-20,000 gallons will be needed throughout the day. Consider that the average golf course uses approximately 90,000 gallons in a day to water their grounds and the average pool uses 18,000 gallons to fill. At the end of the event, the water will be recycled by the City of Guelph.